Russia’s T-50 PAKFA fifth-generation stealth fighter is about to undergo flight testing by military pilots for the first time. The Russian Aerospace Forces (VKS) said on January 6 that it would take delivery this year of five of the aircraft that have been flight-tested by Sukhoi at the Gromov Flight Research Institute (LII) in Zhukovsky. But the VKS, which since last year has encompassed the Russian Air Force and the Russian Aerospace Defense Forces, made no further mention of any order for production aircraft. The five T-50s will now be transferred to the Chkalov VKS State Flight Test Centre base No. 929 at Akhtubinsk. Once at the Chkalov center, the aircraft will be put through a two-stage program, “State-Joint Flight Testing,” that allows for military pilots to gradually take over the validation of the aircraft. This joint testing program is in theory the last process that the prototype aircraft would undergo before the go-ahead is given for the T-50 to enter series production. In the first stage of the program, the industry pilots who have been flying the T-50, which is developed by the state-owned United Aircraft Corp. (UAC) will train a cadre of military pilots to fly the aircraft. In the second stage, flights would be conducted entirely by VKS pilots and validate whether or not the aircraft meets the service’s operational requirement. Russian defense industry specialists, speaking on condition of anonymity, told AIN that the authorization for the T-50 to enter production need not wait until the final results of the joint state testing program. One said: “The VKS flight-test team could issue a preliminary report stating that the major points of validation have been successfully completed and that production may commence.” He noted that in some previous programs, the seal of approval for series production was given as far in advance as a year before the testing program was formally completed. Two possible reasons for this are that the next-generation fighter engine and an AESA radar for the T-50 are still not ready for series production and will have to be certified on the aircraft. At the moment the T-50 is fitted with the same Saturn 117S jet engine and NIIP-built N035 Irbis passive electronically scanning array that are part of the standard configuration for the Su-35. 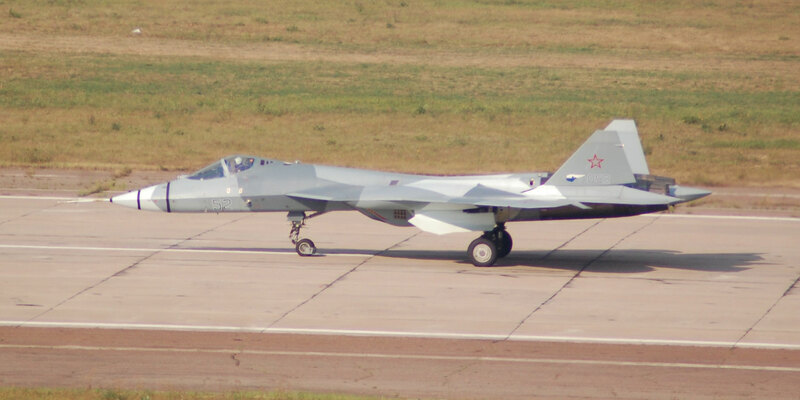 Once off the production line and accepted into service, the first T-50 series-production aircraft would be delivered to the Russian Ministry of Defence’s 4th State Centre for Training of Aviation Personnel and Combat Testing at Lipetsk. At this stage the VKS pilots who have completed the State Joint Testing program would create a cadre of instructor pilots drawn from the combat units slated to be the first operators of the T-50. The announcement regarding the T-50 program also stated that the VKS would take delivery of some 100 aircraft and helicopters. These will include more than 20 Sukhoi Su-30SM fighters, a number of overhauled and modernized Tupolev Tu-95 and Tu-160 bombers already in long-term VKS service and an unspecified number of new Mil Mi-28 and Kamov Ka-52 combat helicopters.